They are there still, following the spiral staircase up & up, all the way up, and each day they are different - the plants behind them change colors, the sky is different, the trees have new leaves, and the lights are ever changing against these new backdrops. It is almost as if they have inhaled a giant breath and come alive, but of course they were alive all the time - it is just their new springtime outfits that make them seem so different. We have new neighbors on this side of the house, new neighbors who are renovating and hammering and tearing out walls, and they are there into the night, all windows open, facing Katie's blue lights, and I wonder what they think, but truly, I care not. It was an inspired moment - that moment when Katie decided to leave the lights up. When she is not yet home, I turn the lights on so they will greet her as she comes down the street. It is my way of saying thank you for this gift, for this wonderfulness of watching these lights against the springtime sky. It is my way of saying how wonderful they were against the white pear tree blossoms while the blossoms were still on the tree, and how beautifully blue the fallen blossoms were at night. Now the wisteria is behind them as I round the corner, lavender drops framing the blue, and the redbud tree's magenta blooms. 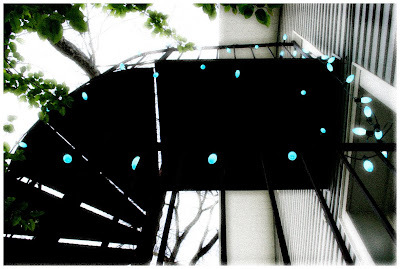 When I stop below the stairs, the sky is the background- blue/white in this image, but the summertime will bring a deeper blue sky, and sunsets later in the evening, and fireflies. These lights are a celebration. to me, most of the subjects that you took in your pictures...always look so soft and beautifully silhouetted against the light. i simply admire them very much. feels as if i am directly looking through your eyes and share your emotions as you captured those special moments. i could easily relate the story with the picture together. such honesty in both of them. I was always wondering who Katie was. Guess she's a neighbor/friend. Lovely words, as always. Stroll the wonderful trails and inhale the smell of azaleas in springtime. I have pink, tangerine and white. Brenda - 10 degress warmer would be perfect! The neighborhood is looking beautiful. Susanna - These blue lights have been incredible. I am so thankful Katie chose to leave them after Christmas, regardless of what others said. I think we should all light our houses with such magic! i love that shade of blue. i wish i had lights like those. i would hang them in my studio, i think. i took the trip back with your links...blue lights delight! Miz Katie - They look like just a normal blue when they are turned off. We were all quite thrilled that they are really a bit turquoise-y. If I had a studio space big enough, me too! ELK - I'm so happy you traveled back in time with these lights. I'm hoping to photo them all through the year & then maybe book them together. Actually, I just thought of that - LOL! But it sounds like a cool idea. And so many people said how very wrong it was to keep them up. I'm glad Katie didn't listen. oh hele's words...so perfect and to know she is turning blue loops of delight is happiness itself. i am listening to 'heaven stood still' while visiting you. it is so full of that drama that i love so much...and a perfect foil to your writing. i want twinkle lights for my hair, my windows, all surfaces that i look up and see. i have some left still from ....christmas. not blue. katie's blue are so perfect for you. inspiring, welcoming and heaven-like. i hope those canvases are speaking your language today. p.s. i felt that confetti land lightly and lovingly over my head and shoulders. i whooped and skipped on! Oh, the fireflies. Oh, yes. The fireflies. Thinking of them makes me long for summer. They are so lovely and my favourite colour of blue It is inspired to leave them up, what a dreamy wonderful idea. I really really wish I could move into your neighborhood. Magical things happen there on a daily (and nightly!) basis. Yes, Miss Sunshine, just a different angle, different time of year. I am tracking these lights throught the different seasons. We really love them!